The British company which secured a measure of fame as Folland Aircraft Ltd originated as the British Marine Aircraft Ltd in August 1935, but assumed its definitive name from Henry Folland when that distinguished aircraft designer left Gloster in 1937 to form his own company at the BMA’s premises at Hamble in Hampshire. 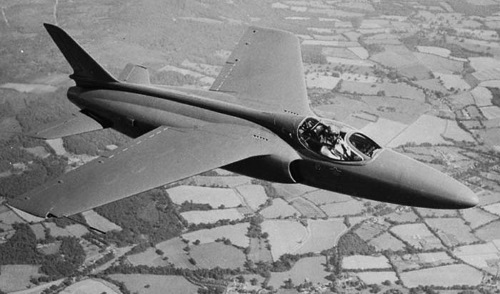 Following the development of a family of engine testbed aircraft which gave useful service during World War II, the Folland company turned to the subcontracted manufacture of aircraft components such as wings for the de Havilland Vampire and Venom fighters. ‘Teddy’ Petter, who had established the basic design of the English Electric P.1 that paved the way for the Lightning interceptor, left English Electric and joined Folland in 1950 as managing director and chief engineer. 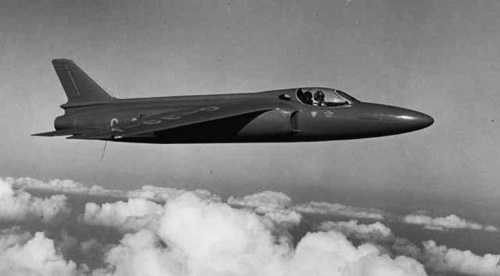 Within a year he was at work on the design of yet another innovative project which constituted the very antithesis of the fighter conceived to Specification F.23/49 for his former employer. Unhappy with the constant spiral of rising costs for military aircraft, and frustrated by the pervading aura of austerity after World War II, not to mention a Treasury parsimonious where military research was concerned, Petter was determined to examine the potential of a turbojet-powered lightweight fighter, bearing in mind a new series of small axial-flow engines being proposed by the Bristol Engine Company. In pursuit of the optimum low-cost, low-complexity aeroplane, Petter studied all manner of configurations, but the path led inexorably back through such mundane obstacles as development time scale and the cost of aerodynamic research, and logic determined resort to an orthodox, if diminutive, aeroplane whose principal design parameters lay firmly within the current aerodynamic and structural states of the art. The preliminary drawings, drafted in 1951, established the basis of a small swept-wing fighter to be powered by the Bristol BE.22 Saturn axial-flow turbojet engine rated at 3,750 lb st (16.68 kN), and this attracted some interest at the Air Ministry until Bristol decided to discontinue the Saturn in favour of a new design which promised to offer a somewhat improved thrust/weight ratio: this latter engine appeared two years later as the Orpheus. Determined to demonstrate the validity of his lightweight fighter concept, Fetter now decided to proceed on a private-venture basis with a smaller feasibility prototype, the Fo.139 with the Armstrong Siddeley Viper ‘long-life’ axial-flow turbojet engine which, with an overall diameter of only 24 in (0.61 m), was expected to weigh little more than 500 lb (227 kg) and provide 1,640 lb st (7.295 kN). The single Fo.139 Midge prototype recorded its maiden flight at Boscombe Down on 11 August 1954 in the hands of Squadron Leader E. A. Tennant and, despite its very low-powered engine, demonstrated remarkable performance. The Midge’s shoulder-set wing had a quarter-chord sweep angle of 40° and featured a thickness/chord ratio of 8%. Moreover, during the course of 220 flights in less than a year, much of which time it spent undergoing evaluation by the Aeroplane & Armament Experimental Establishment, it dived at supersonic speed. Thereafter it attracted considerable interest abroad, being flown by evaluation pilots of the US Air Force, Royal Canadian Navy, Royal New Zealand Air Force, Indian Air Force and Royal Jordanian air force. Unfortunately the Midge was destroyed in a fatal accident at Chilbolton on 26 September 1955 while being flown by a Swiss pilot. Although the Air Ministry had displayed scant interest in the Midge, the little aeroplane fully vindicated Petter’s ideas by careful attention to a very clean design and, following Bristol’s announcement in November 1953 that the more powerful Orpheus was to enter production, he returned to the slightly larger Saturn-powered project to develop it around the new Bristol engine as the Gnat. It is not too fanciful to point to the Midge as the seed which gave life to a whole new concept of light fighters and dual-role fighter/trainers which gained increasing favour among the world’s smaller air forces during the next 30 years.